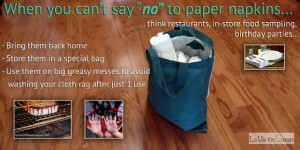 Home/Green Tips, Health, Start Here/5 steps to easily kick paper towel out of your life for good ! Talking to a few friends recently made me realize that the use of disposable paper towel at home is deeply anchored in people’s mind as both synonym of hygiene and cleanliness. While I agree with these associations, I would have come up with negative ones first. Like waste, pollution, single usage and expensive. Grab, use, throw away. I know everybody loves their disposable single-use picker-upper. By some estimates, the average American family uses 1.5 to 2 rolls of paper towels per week. Sooo convenient. No so great though, is the amount of paper wasted. In the U.S. alone we use 13 billion pounds of paper towels per year. Just 1 less sheet per person per day would spare the landfills from over 570 million pounds of paper each year. 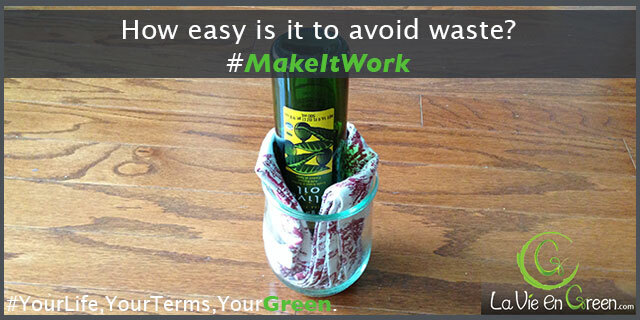 We all need a quick, easy way to clean-up a mess, yes, but there are green ways to do this. As in eco-conscious and sustainable. And no, giving up paper towel use does not mean lowering down our personal hygienic standards. We can get the job done, spare the landfills from a huge source of waste, save some trees, and save money in the process too. So what’s not to like? The idea is simple: use fabric instead of paper. 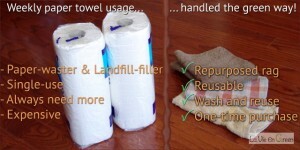 Paper towel creates waste and you always need to buy more. 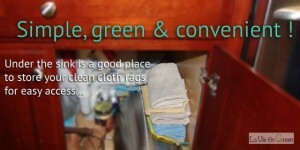 With cloth rags, just wash & re-use, and the cost is minimal if not free. Buying commercial cloth rags is a one-time investment that will pay for itself in a matter of months, if not weeks. But you can go the fully green way and make your own: re-use old bath towels, up-cycle tee shirts, re-purpose your missing socks, re-size and recycle bed sheets, table cloths, all linen really…. If you immediately get rid of things you don’t use anymore, then just try a “Wanted” post on Freecycle, or pay a visit to your local Thrift Store. Fairly assuming that you own old cloth items lying around and ready for a new life, you can either re-purpose them as is, or if you feel crafty, customize for more convenience (e.g. 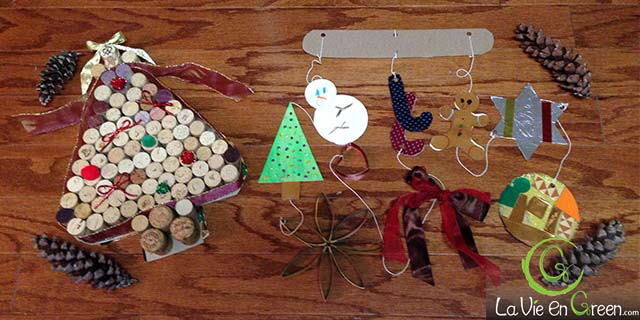 sew a little loop to hang them on a door knob), your choice! 1- Go around your home and list all your paper towel usages and needs: You will likely find one or more of them per room. Also think about your car if you own one, the office if you work in one, a dedicated gym bag? A diaper bag maybe? On-the-go uses do add up, so definitely include them. 2- Prioritize your list of items: Start with the ones you feel are easiest to modify, so you can smooth the transition process into your or your family’s routine. 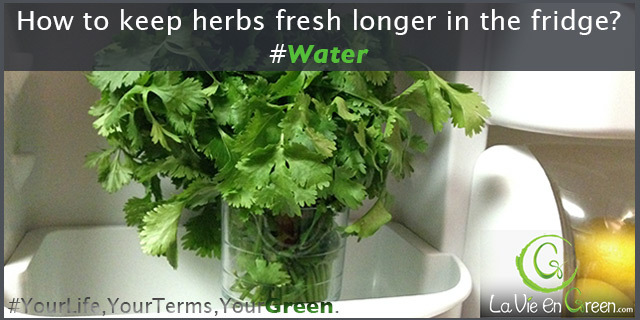 3- Pick the first item from your list and green it up by switching from paper to cloth: For example, switch to hand towels in the kitchen and bathrooms to wipe your hands dry after washing them. 4- Go down your list: Once you or everyone is on board with the “new way” to handle a situation or a type of use, move on to the next item on your list. Doing so gives time to integrate the new behavior and it is not overwhelming or a disruption to your daily routine. 5- Expand the “green way”: As you green up your tasks one by one and adopt more new sustainable habits, start including all types of disposable paper items to the challenge. Wipes, tissues, table or lunch box napkins anyone? Replace all this paper with fabric! Feel free to customize per user, to each his/her own for an even easier, fun transition, especially with children. You could use specific fabrics or designs for specific tasks, or a color per person, per room… whatever you feel is helpful in durably adopting your new eco-conscious way to wipe-up. One rag per type of use. 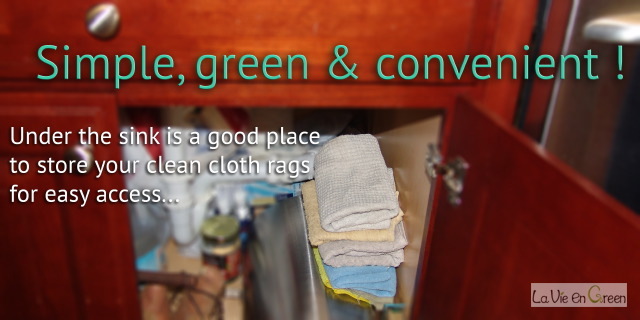 This may seem obvious, but use a specific rag each for your hands, your dishes, floor, furniture, window, table, nose…etc. And keep them handy, at an arm’s reach so a spill can be taken care of before it has time to spread (kitchen closets, under the sink…). Washing frequency. Another obvious point to consider, but it is personal so define timing based on type of uses. For example, when wiping your hands dry, your hands being clean, you can definitely re-use the cloth rags several times before washing. You could change them when you change your bath towels and wash them all together ? If you wipe up something greasy or clean your kitchen floor, your windows, then it might be a one-time use before the rag goes in the washing machine. For all the “in between” cases, decide based on the nature of the use (e.g. 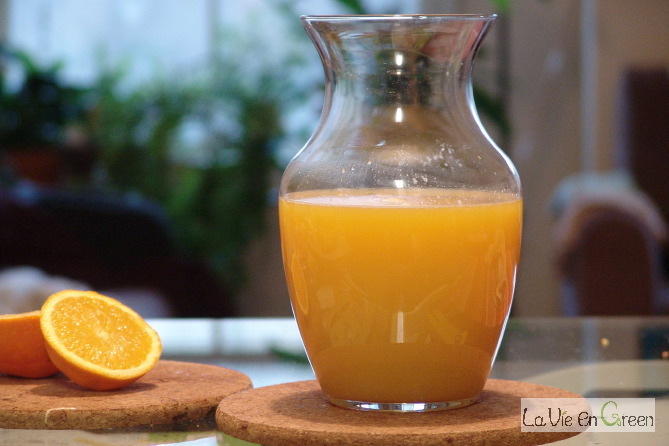 rinse and reuse a rag used to wipe off OJ or coffee spills, but wash one used to wipe off oily salad dressing), establish a rule and then stick to it. Washing routine. Some clean all rags together once a week, others separate them based on uses, and clean as needed. 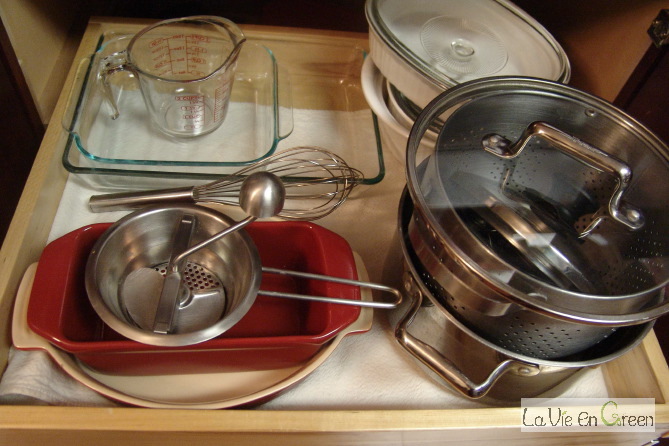 For example, everything related to housekeeping can go together in one load but separate from what is used for cleaner tasks like wiping hands, dishes… where technically the objects that are being dried off are clean. 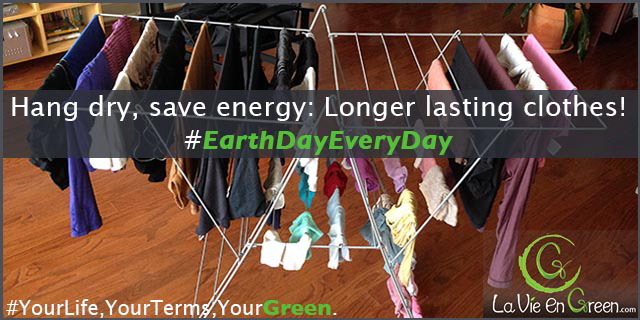 In any cases, as you use your rags, rinse and hang them to dry after each use. That way they are always ready for their next job. One may think paper towel is biodegradable so it’s not a big deal. Well, it does not eliminate paper waste, money spent, and it’s not even that simple: the dirtier and wetter a sheet of paper towel becomes, the less biodegradable it is. There are also pricier kinds with a plastic lining inside so they are more resistant and waterproof. That’s the (twisted, if you ask me) “reusable disposable” concept that supposedly saves you money as you get more uses out of one sheet! But it is still trash and on its way to the landfills once you’re done with it. Also, let’s not forget all the toxic chemical dyes (colors) and fragrances some brands use. And the fact that most non-woven wipes are not even biodegradable at all. 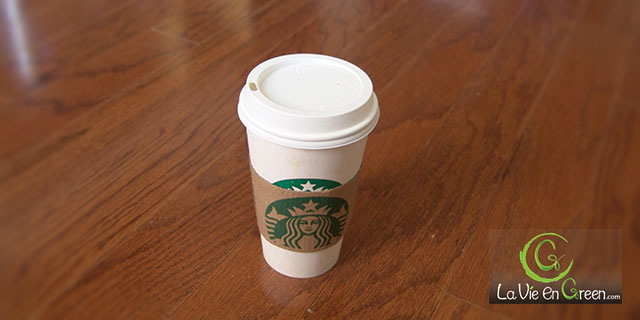 So it really is better to try and reuse an existing item again and again, than going the disposable single-use route. 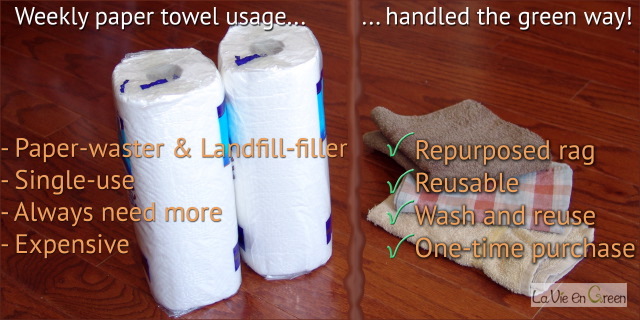 Do you use a lot of paper towels at home, at other places and on-the-go? If so, do you think it would be easy to switch your mindset? Hopefully you’ll give this a try and share your progress with us! Nothing beats a real life experience and a good conversation about it to motivate other people to do it too!